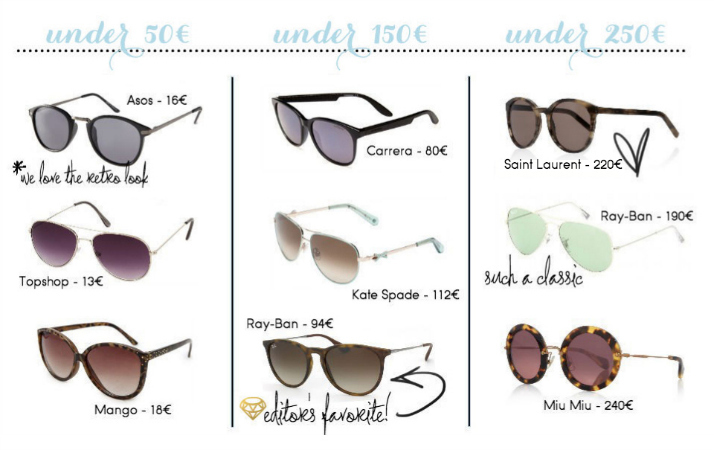 When we’re headed to the beach for a day of fun in the sun we prefer a pair of shades under 50€. The chances of that pair getting scratched by the sand, or lost in the waves are bigger than you’d like to think and in that case we’d rather not have lost or damaged a 200€-pair! For our other pairs, we’re usually in the “under 150€” category with classics like Ray-Bans or Carreras – but every once in a while a girl has to treat herself to something, and for those occasions we’ve picked out 3 beauties we’re currently loving. Saint Laurent, Miu Miu and Ray-Ban are all on our shopping list for this summer. Which are your favorite sunglasses for summer? Show us on Instagram by using the hashtag #lovedailydose! Die Erika liebe ich auch, habe sie seit wenigen Wochen in Beige/Rosé und trage sie ständig! Zuerst einmal: Die Seite ist einfach wundervoll geworden! Das Design ist der Hammer, ich bin total begeistert und gespannt, was noch so kommt! Nun aber zu meiner eigentilchen Frage: Wie sitzt denn die Erika von Ray Ban?